Tienchi is a neutral herb which positively affects the heart and tributaries. Research in China shows that Tienchi may increase blood flow in the coronary artery, (the artery that supplies the heart with blood) and increase the consumption of oxygen in the middle muscular layer of the heart. This helps to maintain normal blood pressure and a regular heart beat. In addition, Tienchi has been used to help maintain normal cholesterol levels in the blood. 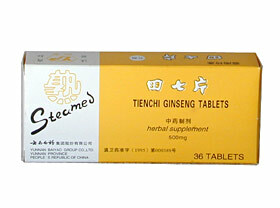 Tienchi has also been found to have positive effects on internal/external bleeding and blood clots. Tienchi has been distributed to members of the armed services of several Asian countries to be used in case of injury. Directions: For adults only. To be taken orally, 4 tablets each time, three times daily with warm water. *This product is recommended to be taken two hours apart from all other medications. Not suitable for children, pregnant or nursing women..